Women and people of color are widely acknowledged to be the communities most adversely impacted by Voter ID laws. These communities must be at the forefront of the battle against discriminatory voter ID laws that have the effect of disenfranchising hundreds of thousands of North Carolina voters. To support this community inclusion and access to information, the Southern Coalition for Social Justice invites you to join a FREE webinar to discuss strategies to combat Voter ID and other forms of voter suppression in North Carolina and throughout the South. 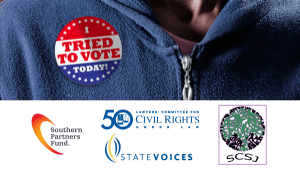 Please join the Southern Coalition for Social Justice, Blueprint NC, State Voices, Lawyers’ Committee for Civil Rights Under Law, and Southern Leaders for Voting Rights (SOLVE) for a free virtual voter ID strategy discussion at the outset of 2014 state legislative sessions. This webinar is free and open to the public. Information is meant for community organizers and concerned citizens looking to find concrete ways to make a difference in the fight for access to the ballot for all eligible voters. SCSJ Executive Director Anita Earls will explain the history and context of voter ID so that participants can understand the precise manner that voter ID laws are used to suppress the vote. The webinar will also include first-hand accounts of how Voter ID laws are being fought on the ground in Texas, Mississippi, Georgia, and Pennsylvania. We will discuss lessons learned, best practices, and how to effectively put together grassroots movements in our own communities. Voter ID is just one of the tools in the arsenal of voter suppression tactics being deployed in North Carolina and beyond. Understanding voter ID is an excellent first step toward understanding and organizing against all forms of voter suppression. We hope you are able to join us on Tuesday, January 28 for this free 2-hour webinar. Click here to register!